By now no one expects African shows put up by African promoters in the Twin Cities to start at the advertised time and indeed throughout the United States, which puts a lot of pressure on the artists to deliver or endure reviews on social media. 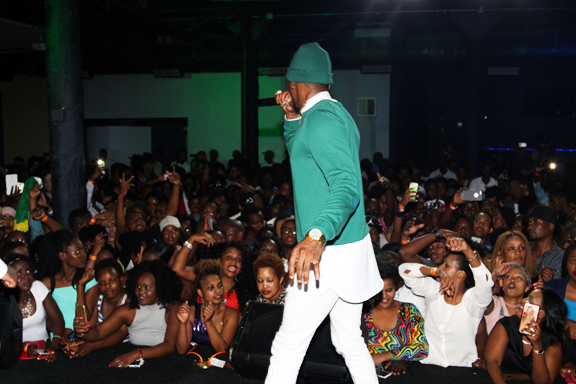 So expectations were understandably high for Diamond Platnumz’s debut performance in Minneapolis last Saturday. What with him being one of the most decorated artists in East Africa and the fact that by 12:30am Sunday morning, fans were getting understandably agitated at downtown’s Azul Nightclub. “Amefika kweli?” (Has he arrived? ), one fan kept asking in Kiswahili fearing a no-show. Given his rise in popularity in Sub-Saharan Africa in African hip hop, it is somewhat surprising that no promoter has brought this African star to the Twin Cities. But at exactly 12:45am, after the DJ collective of DJ Dennis, DJ Nodeh and DJ Shortlegg had sufficiently warmed up the crowd starting at the 9pm opening, a quick tunnel was formed by security in the style of American football and Diamond and two of his dancers quickly sprinted from a side door next to the VIP section on to the stage before fans realized what had happened. His official traveling DJ was ready and Diamond then launched into a 22 song set list comprising his old and new hits playing for exactly 70 minutes non-stop, with no encore. “Twin City, how are you?” he would say in between songs, and the mostly female fans would cheer in response. Most of his songs are about love. Bongo Flava, as Diamond’s genre of music is referred to, is not one for sitting down and enjoying. It is for making your body move and the fans were ready. Screaming ladies had already staked out a vantage point at the front in the mostly standing crowd show (there were some VIP seats at the back but a quick glance and everyone there was standing). He mixed the old and the new and took the crowd through a journey of his musical career starting with his originals like “Kamwambie” (Go tell him/her), “Kesho” (Tomorrow) to crowd pleasers such as “Kidogo” and “Make Me Sing”. But it was his love anthem “Number One” that had the crowd, and especially the ladies moving. Half way through the concert, Diamond said he wanted some “beautiful ladies” on stage to show off their dancing skills. About ten ladies quickly scampered up the stage and a ten minute hip shaking contest of sorts ensued, with Diamond getting close to each lady, singing to each of them one of his popular songs “Nasema Nawe” while inspecting their dancing. “Nasema Nawe” which means “I am talking to you” was a big hit especially in Tanzania and Kenya due its Taarab beat, a traditional musical style originating along those countries’ Indian Ocean coastline. The song is about a promiscuous woman whom the neighborhood is tired of. The song’s YouTube video is one of his most watched with over 9 million views since he posted it on his YouTube channel in March 2015. If there is an unfortunate side to the Diamond show, it was for something outside of his control. The sound system was horrible, a letdown of this major African artist by either the club or promoters. The amateurish sound system was most noticeable during the call and response that Bongo Flava artists like Diamond love indulging in when performing as they try to engage the crowd. The speakers would give a quick grating sound as Diamond’s official DJ would turn down the music so the crowd could finish a lyric on a song. The transitions were anything but smooth. At times it was like cheap speakers turned up way too loud to try and attain a premium sound. It was not a particularly good night if you are an audiophile. Azul is a relatively modern nightclub in Minneapolis’ downtown entertainment district and it was hard to understand how it could not adequately deliver the 92 decibel level sound we measured on our sound app. 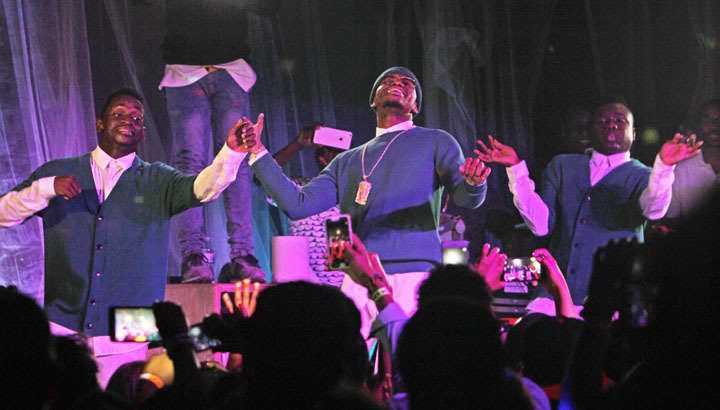 Bad sound notwithstanding, Diamond showed why he is one of the most decorated artists on the African continent and the Minneapolis crowd responded accordingly. His 28-year old body is still good for a somersault here and there, and he showed it is not just his voice that can do the entertaining. 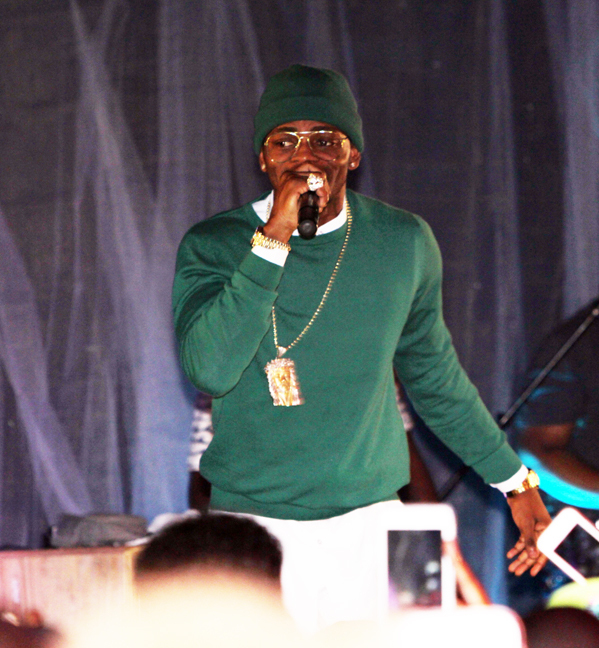 He and his two male dancers were clad in green sweaters, the colors of the ruling party in Tanzania that he supports. He released a song for the Chama Cha Mapinduzi party in a past election campaign. The two male dancers were a nice complement to Diamond as the three showed off their dancing and acrobatic skills. The late start (about an hour before club closing time), showed why African promoters need to get better with time management. Diamond started at 12:45am and the club, as city ordinance requires, had to close at 2:00am. He finished performing just five minutes before closing time, leaving no room for an encore if concertgoers demanded one. Promoters then got on stage at 2:00am to frantically exhort the crowd to leave “You know the law, please get out. Security get everyone out of here,” a gentleman thundered on stage. “Head to the after party, Diamond will be there and it’s only $10,” he said as the crowd obliged and filed outside as they loudly reviewed the concert in groups.